The human heart consists 4 valves. These valves ensure that the blood flows through the heart in the correct direction. If the valve becomes too narrow or becomes incapable to allow enough blood to flow through it, it is referred as valve stenosis. Leaky valves are referred as “regurgitant valves” or as “valve regurgitation”. Many other valve problems develop due to age-related causes or other diseases such as rheumatic fever and infective endocarditis. An improperly opening valve due to thickness, stiffness or flap fusion is referred to as “Stenosis”. Due to this abnormality, the heart has to work more to pump blood through the valve, or the body may suffer from a decreased oxygen supply. 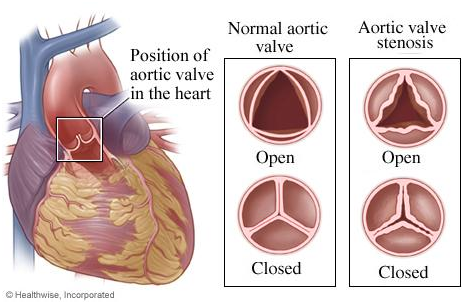 Aortic valve stenosis (AS) is one of the most common and most serious valve problems. The aortic valve is on the left side of the heart and opens when the blood is pumped from the heart to the rest of the body. AS is a narrowing of the aortic valve opening, restricting the blood flow from the left ventricle to the aorta and may also affect the pressure in the left atrium. Although some people have AS due to a congenital heart defect called a bicuspid aortic valve, this condition more commonly develops during aging, due to calcium deposition or scarring, which damages the valve and reduces the amount of blood flow. AS is not always symptomatic in nature. Many people with AS remain asymptomatic until the amount of reduced blood flow decreases to alarming low levels. The person suffering from AS may not always complain of symptoms. However, if family members notice a reduction in daily physical activities or noteworthy tiredness, a visit to the doctor to check for the possibility of reduced heart function is mandatory. 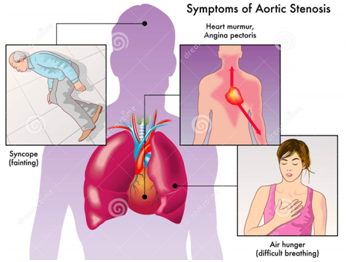 In addition to the symptoms of aortic stenosis, which may cause a patient to feel faint, weak, or lazy, the wall of the left ventricle may also show muscular thickening due to the ventricle working harder to pump blood through the narrow valve opening into the aorta. The thickened wall takes up more space inside the lower heart chamber, allowing less room for a satisfactory amount of blood to be supplied to the body. Early treatment can help to reverse or slow down the progress of this disease. Aortic stenosis mainly affects older people as a result of scarring and calcium buildup in the valve flaps. Age-related aortic stenosis usually begins after age 60, but often does not show symptoms until 70 or 80 years. The most common cause of aortic stenosis in young people is a birth defect where only two cusps grow instead of the normal three, which is called a “bicuspid valve.” Another cause may be that the valve opening does not grow along with the heart. If there are no symptoms or if symptoms are mild, a doctor may advise to simply monitor and follow up on any changes. However, anyone with aortic stenosis should be checked with an echocardiogram (heart ultrasound) to confirm the safest and best options for treatment. Conversely, even if no symptoms are present, it may be advisable to proceed with treatment or repairs based on the test results. Possible treatments may include valve repair or valve replacement. If consensus is reached and surgery (Surgical Aortic Valve Replacement or SAVR) is recommended, it is important to proceed without postponing this important treatment. What is a Transcatheter Aortic Valve Implantation (TAVI) or Transcatheter Aortic Valve Replacement (TAVR)? 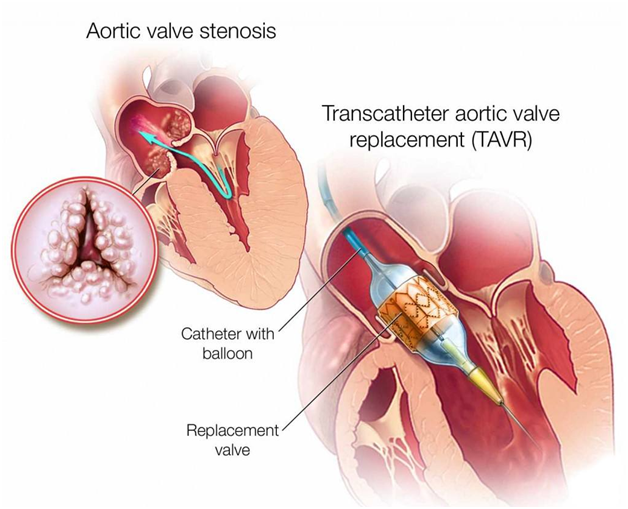 TAVI or TAVR is a minimally aggressive surgical procedure to replace an aortic valve which becomes inefficient due to problems like aortic stenosis. Who is a good candidate for TAVI? As per current recommendations, TAVI procedure is kept for patients considered at high or intermediate risk for an open heart surgery or Surgical Aortic Valve Replacement (SAVR). Because of this reason, most of the TAVI candidates are aged 70 to 80 years, frequently suffering from other medical conditions. 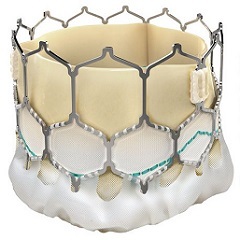 TAVI might also be an effective choice to advance quality of life in patients who otherwise have limited selections for repairing their aortic valve. What is involved in a TAVI procedure? A TAVI procedure can be performed through minimal openings that leave all the chest bones intact, as opposed to an open heart procedure where the chest is separated surgically for the valve replacement. 2. Through a large artery in the chest or through the tip of the left ventricle (the apex), which is known as the transapical approach. How to prepare for TAVI? Prior to surgery, the medical and surgical team will evaluate the patient’s overall condition via X-rays, CT scans, blood tests, and others to check the health of patient’s lungs and heart. The medical team will also recommend an echocardiogram to the patient to evaluate his/her aortic valve. The medical team may also perform an angiography to evaluate his/her heart. Tell the doctor about any medicines he/she is taking, including over-the-counter medicines. If the patient smokes, he/she should ask the doctor how soon before surgery he/she needs to quit. Stop certain medicines if the doctor instructs. Stop eating and drinking, usually at midnight before surgery. This is necessary as the patient will receive general anesthesia for the surgery. The patient will need to remove any jewelry or other objects that may interfere with the procedure. The patient will need to remove the clothing and will be given a gown to wear. Patients will need to empty their bladder prior to the procedure. An intravenous (IV) line will be started in the patient’s arm or hand. Additional tubes (catheters) will be inserted in the patient’s neck and wrist to monitor the status of their heart and blood pressure or to take blood samples. Alternate sites for the additional catheters include under the collarbone area and the groin. The patient will be positioned on the operating table, lying on their back. The anesthesiologist will continuously monitor the patient’s heart rate, blood pressure, breathing, and blood oxygen level during the surgery. Once the patient is sedated, a breathing tube will be inserted into his/her throat and into the trachea to provide oxygen to his/her lungs. The patient will be connected to a ventilator, which will breathe for him/her during the surgery. A catheter will be inserted into his/her bladder to drain urine. A transesophageal echocardiogram (TEE) probe will be inserted into his/her esophagus to help see the valve. The skin over the surgical site in his/her groin will be cleansed with an antiseptic solution. Surgeon will make an incision in the patient’s groin area to locate the femoral artery which carries blood from the heart down into the leg. He/she will place a catheter into that artery and thread it to his/her heart and through the aorta, to reach his/her aortic valve. The surgeon will also place other catheters in the heart to take measurements and X-ray pictures during the procedure. The surgeon will guide the replacement valve, inside an expandable balloon, up the femoral artery catheter and through the patient’s old aortic valve. 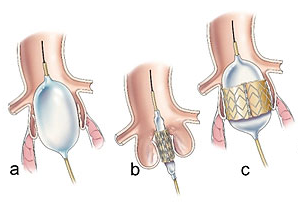 Once the balloon is properly positioned, the surgeon will expand it and implant the new valve to replace the old one. The doctor will take measurements and images to make sure the new valve works properly, before removing the catheters. The doctor will finally close the artery and the incision in the groin area with sutures. The patient will be shifted to the ICU, so that he/she can be monitored closely while he/she recovers from surgery. As he/she recovers, the tubes in his/her veins and arteries that provide nourishment and monitor heart functions will be removed. He/she will soon be able to get up and walk and return to a normal diet. Still the patient may need to stay in the hospital for several days. The doctor may give him/her blood thinning medicine to prevent blood clots after a TAVI. To make sure he/she is getting the right dose, he/she may need to have his/her blood checked regularly. Slowly restart normal activities, but avoid any heavy lifting. Ask the doctors when he/she can restart driving, work, and sexual activity. Watch the groin for any sign of swelling, redness, bleeding, or discharge. Let the doctor know if he/she feels any pain or has fever, bleeding, or shortness of breath.